I’ll respond to those objections that lists have a very limited purpose for business. They are more of an operational nature. They won’t serve well the need of tracking trends over time, which requires more altitude. Trend views should display aggregates, which do require transaction level data underneath. Hence the need to extract those transactions from Marketo, cleanse and assemble in Alteryx, and serve in aggregates in Tableau for analysis. how many web forms were filled last year? How many unique (to the best of Marketo’s knowledge) leads have filled a form last year? It gets worse if you consider the issue of leads with multiple activities, which is not a far fetched scenario: a lead might visit your website more than once, at least I hope so, for the sake of your business… Let’s illustrate with Lead XYZ who filled out a form in February, one in March and one in June. Well, a Marketo report against the Lead database will give you different counts according to the time slice you select: 1 form filled for the Year, 2 if you break it down by Quarter (1 for Q1, 1 for Q2) and 3 if you break it down by Month! With the newly released Alteryx V10, comes an eagerly expected new version of the Marketo Connector. The now deprecated earlier version of the connector was based on Marketo’s SOAP API. In the context of Marketing analytics, that connector worked, but too slowly to handle data volume, as a SOAP API is designed for a more transactional purpose, imposing rate limits of 100 API calls in a 20 second window. 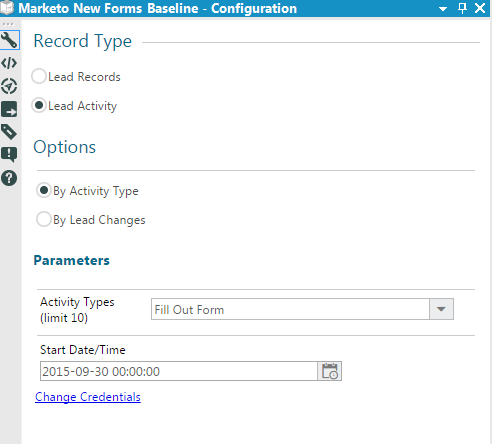 Any live Marketo instance’s daily volume of transaction will easily break those limits. The version of the connector delivered with Alteryx V10 is based on Marketo’s REST API, widely more adequate for manipulating volumes of transactions. Here is a handy guide to help your Marketo Admin generate connection credentials you will need, to use the connector. Now Marketo’s REST API is not perfect, yet. The most glaring limitation is that it does not feature (yet?) 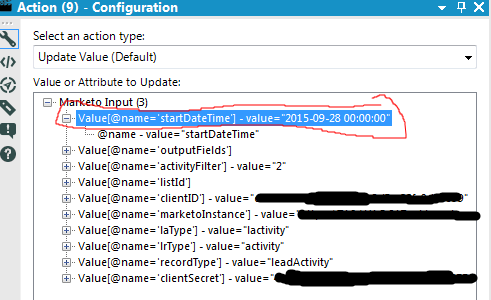 a DateTo field to select transactions. This creates head scratchers for anyone who needs to refresh data sets in their data warehouse without reloading the whole history. Especially since Marketo is restricting contractually the number of API calls you can make against their API, and will charge you accordingly. I will hopefully contribute to alleviate that issue demonstrating how it can be done with an Alteryx workflow or an ETL. The approach consists in creating first a baseline with the required history depth, and then a delta mechanism to append new transactions to the baseline, and therefore extract activity transactions only once. This is also a good exercise to understand hands on how the Marketo API connector works. I then have a Formula tool, which creates a time stamp of when the workflow was last run, and therefore when the data was pulled, called Last Load Time, using the simple DateTimeStart() function. The goal of that workflow, admittedly more complex, will be to append the new transactions that occurred since you built your baseline, or later on, new transactions since you last ran your Delta, without re-extracting the transactions you already have pulled. You can get started by saving your Baseline Workflow As a Delta workflow, since we will re-purpose quite a few object used for the baseline. There are 2 branches in the workflow, one for Baseline and one for New Transactions. The Baseline is a simple dump which will unite with the new transactions through a Union tool. stamping the load time for these new transactions and Union them with the baseline. Then we put a Block Until Done tool so that the whole DB gets processed, before we drop it and rewrite it inclusive of all the new transactions. We can then proceed to export it to a TDE file for Tableau. 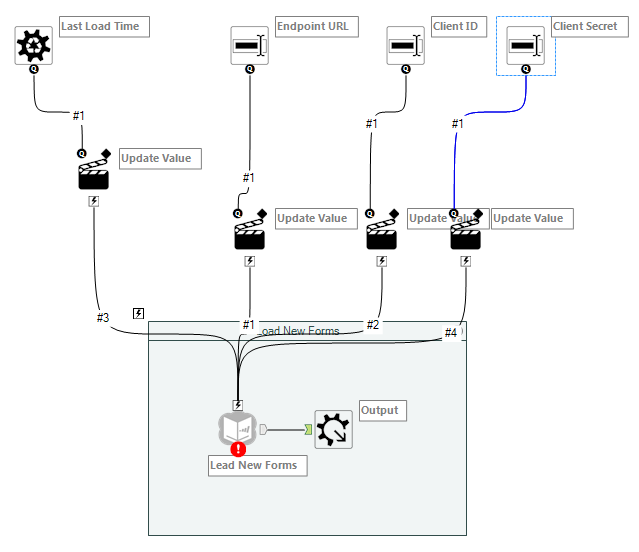 This entry was posted in Alteryx, Marketing, Marketo and tagged Alteryx, API, Marketo. Bookmark the permalink. Hi, a simple Alteryx workflow to get Marketo activity data such as emails sent, delivered, clicked would have been great. I hear you. Unfortunately, the assumed lack of a DATETO filter in the REST API provided by Marketo, means there CANNOT be a simple workflow, unless you don’t need to refresh your extract… Since I wrote that post, there has been more and more restrictions built by Marketo into that REST API to limit the extraction of activity transactions. I am conducting research on that topic, which I will share soon in a new post. Stay tuned! Hi Frederic, Has there been an update on the activity transactions. I am looking to import email insights transactions as well like the click, open etc., Any insights you have will be helpful. Thanks! Most problems solved with the Bulk API, check out my post on the topic! Only other downside with this default tool is that there is no way to set a token refresh – long running jobs will timeout with error. The new Bulk API I just wrote about in my new post does not have that issue anymore! Check it out!